Stan Green came into work at the Orange County Clerk of Courts one morning in September and sat at his desk. He doesn’t remember much, but he knows his heart stopped. Green’s co-workers at the clerk’s office, a nurse who happened to be nearby and four first responders were honored Monday for the work that likely helped save Green’s life after his cardiac arrest. When a heart stops beating every minute is critical, Orlando Fire Department Deputy Chief Richard Wales said. Cardiopulmonary resuscitation, if done right, can keep blood pumping to vital organs, fighting off permanent damage to brain function. Deputy clerk Sharon Bennette said she had just stopped by Green’s desk that morning to talk. He seemed fine, she said. Suddenly, deputy clerk Bridgette Harper heard a strange sound coming from Green’s desk. It sounded like snoring, Bennette said. Bennette rushed over to Green, who looked like he was asleep or unconscious. It was a terrifying moment, she said, but she and her co-workers snapped into action. Gracy Uy and Matthew Domenech helped get Green on the ground. Bennette started performing CPR, grabbing Lashaunda Anderson’s hand to help when she realized she needed more power. Brian Williams got a defibrillator, a device that delivers an electric shock to people whose hearts have stopped beating. A nurse who happened to be in the lobby, Emmajane Fernandez Devora, rushed over to help, as did two Orange County sheriff’s deputies — Cpl. Hiram Bustamante and Master Deputy Dave Triano. Firefighter-paramedics Tony Parisi and William Flinn got to the office within a few minutes. Green already had his pulse back, but still needed help breathing, Parisi said. They put a bag valve mask over Green’s nose and mouth and squeezed the attached plastic balloon to push oxygen into Green’s lungs. Once he was more stable, they took him to a hospital. On the way out the door and to the hospital, Bennette said she saw Green give a thumbs up. “I was like, ‘Thank you Jesus,’” Bennette said. Bennette said she had taken a CPR course at Orlando Regional Medical Center in the last year. Wales suggested that people take a hands-only CPR course and learn where the defibrillators are in their workplace. The Orlando Fire Department offers free CPR training, he said. Green is doing better now, he said. He still has regular medical appointments, but he came back to work Dec. 4. 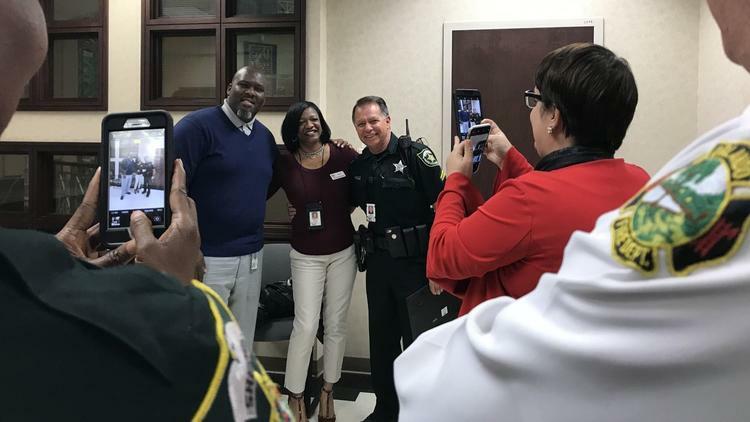 On Monday, after Orange County Clerk of Courts Tiffany Moore Russell gave his co-workers certificates, Green gave each of them a big hug. “I think it goes without saying, they know I love them,” Green said.